The Martha Stewart Living Bedford 1-1/4 in. 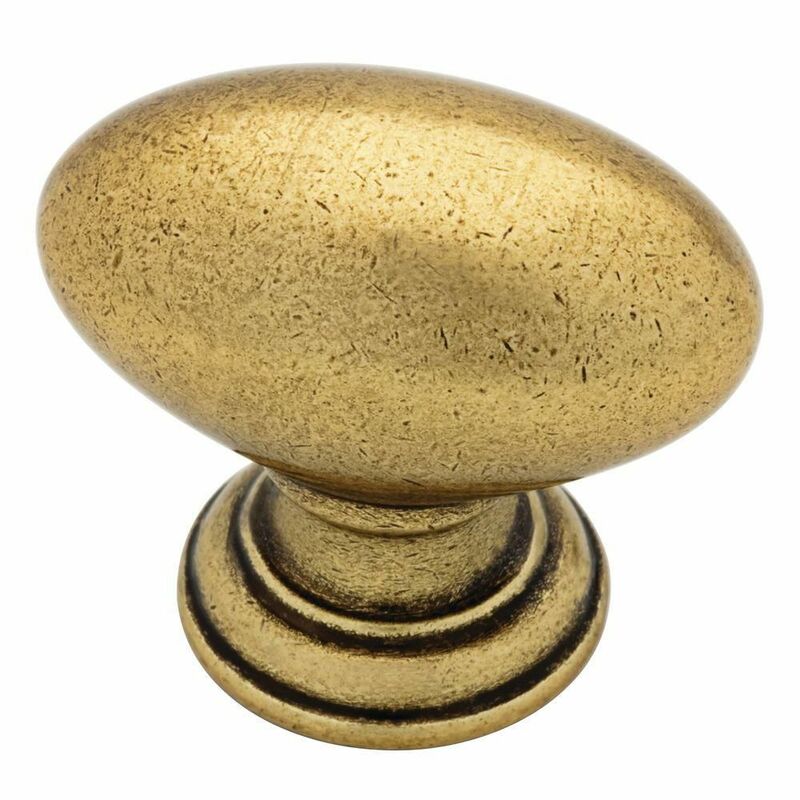 Satin-Brass Rugby Knob features an oval shape designed to feel natural in your hand. The knob is smooth and simple with a traditionally inspired design accent. Screws are included for easy installation. These Liberty 1-1/4 in. Satin Nickel Round Knobs (10-Pack) are ideal for use with a variety of cabinet styles and drawer fronts with a satin nickel finish that complements most styles of decor. The Satin Nickel finish on these knobs are sure to be enjoyed for years. Simple yet sophisticated, the Garrett knob offers a perfect finishing touch for your room. The soft round knob complements a wide variety of décor. Ideal for both cabinetry and furniture. 1-1/4 Rugby Knob, 1 per package The Martha Stewart Living Bedford 1-1/4 in. Satin-Brass Rugby Knob features an oval shape designed to feel natural in your hand. The knob is smooth and simple with a traditionally inspired design accent. Screws are included for easy installation. 1-1/4 Rugby Knob, 1 per package is rated 4.9 out of 5 by 8. Rated 5 out of 5 by David from These pulls are great. We paired them with some aged... These pulls are great. We paired them with some aged $80/piece unlaquered brass long pulls and they match perfectly. They gave our kitchen an amazing look. Considering we were looking at pulls that were $26 each these worked even better and are MUCH more affordable! Rated 5 out of 5 by AD from Great antique look. Color true to picture. Just what I wanted for the small, narrow areas I use... Great antique look. Color true to picture. Just what I wanted for the small, narrow areas I used them. Rated 4 out of 5 by Air101 from Much darker than pictured These are on the small side and much darker than pictured. That being said, they are solid and vintage looking. Rated 5 out of 5 by Ariel from Looks very expensive...solid and heavy. Looks very expensive...solid and heavy. Rated 5 out of 5 by Clareart from Great look Beautiful knobs w a subtle warm brass finish, just a few really tiny darker pits present to create the illusion of age. Had to countersink the screws a bit (2 lengths provided) to get the proper fit. Rated 5 out of 5 by lovewood2 from Classic Old English Hardware Just perfect, well made and 1/5 the cost of the same knob advertised elsewhere! Rated 5 out of 5 by Kenny from Solid hardware, solid price I bought two of these to refurbish and old sewing box I bought as a present. They have a solid feel and weight and the finish is antiqued so they fit well with the box. Hardware is designed for a standard thickness door but was easily modified. Rated 5 out of 5 by BigFoot from Excellent Product We just added knobs to all of our kitched cabinets. These are the perfect addition to give the cabinets the look and functionality that we need now.